Looking for Lincoln in Bloomington, Illinois – Where is Ruthi? Abraham Lincoln is almost as easy to find in Bloomington, Illinois as he is in his hometown of Springfield. Bloomington was the home of Lincoln’s great friend and political ally, Judge David Davis. Davis was a traveling circuit lawyer turned judge when Lincoln was traveling the same circuit as a lawyer. They were both Whigs and were instrumental in starting the Republican Party when the Whig party fell apart. In 1860 Judge Davis acted as Lincoln’s campaign manager when he was nominated as the Republican candidate for the U.S. presidency. President Lincoln appointed Judge David Davis to the U.S. Supreme Court in 1862. Judge Davis arrived in Bloomington in 1836 and quickly established himself as a respected lawyer and politician. He bought and sold land and began to make his fortune. He built a house for his wife on a piece of land on the edge of town, then added to it as his family grew. This would be the house that Abraham Lincoln would visit on his many trips to Bloomington. Eventually, in 1872, seven years after Lincoln was assassinated, Davis tore down that house and built a thirty-six room mansion on the site. The David Davis Mansion State Historic Site is available for tours; and you can obtain an Abraham Lincoln National Heritage Area national park passport cancellation stamp. An old courthouse on the square in downtown Bloomington is the home of the McLean County Museum of History. After stamping your passport, you can find Abraham Lincoln in a corner room on the second floor. A well-made video describes the real Abe through personal accounts from people who encountered Lincoln in Bloomington. It’s worth a watch to get an idea of the personality of Honest Abe. 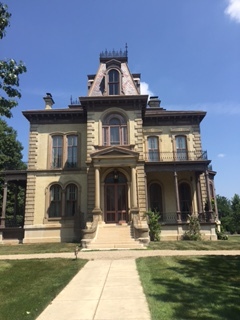 The museum also describes several of Lincoln’s cases when he was a circuit lawyer in Bloomington including a trial when Lincoln was the prosecuting attorney in a murder case. Despite Lincoln’s five hour closing argument, he lost the case. Abraham Lincoln also practiced family law. He represented Mary Beard when she sued her husband for divorce on the grounds of cruelty to herself and her child. She got her divorce and custody of her son and her ex-husband was ordered to pay for all court costs. This entry was posted in Uncategorized and tagged Abraham Lincoln, Abraham Lincoln National Heritage Area, history, National Park. Bookmark the permalink.